There is ample evidence that the average active investor gets lower returns than passive investors, but that doesn’t preclude a minority of active investors from outperforming passive indexes. The great investor and hedge fund manager, George Soros, serves as a hero for the active investor who dreams of outsmarting the market. In his book Soros: The World’s Most Influential Investor, Robert Slater looks at Soros’s life, investing record, philanthropy, and politics. Soros is best known for his 1992 bet against the British pound when the Bank of England was forced to abandon the exchange rate mechanism designed to keep currency values within certain ranges. Soros made about a billion dollars in this high-stakes gamble against the pound and another billion dollars in simultaneous bets on other currencies. Some viewed Soros’s actions as stealing from the British people, but Soros sees himself as a “critic” of financial markets who backs his opinions about the value of stocks and currencies with big financial moves. Soros’s investing record is legendary. From 1969 to 1993, an investment in his Quantum Fund rose over 2000-fold! His investing approach is mainly to use macroeconomic information to predict boom-bust cycles, invest early to catch the boom, and sell short before the bust comes. Soros calls his investing theory “refexivity”. At times investor behaviour significantly deviates from the predictions of efficient market theory, and market activity starts to affect fundamentals rather than just reflecting them. This reinforcing feedback leads to a bubble that must eventually burst. The key is to predict where and when the booms and busts will occur. Critics claim that Soros’s success came from access to information from powerful people in government and business. There may be some truth to this, but it seems likely that most of his success came from making accurate predictions a high fraction of the time. Soros found it more difficult to give money away than to make it. His early experiences of hiding from Nazis in Budapest jails made him believe strongly in open societies, and he spent billions in efforts to open societies in Eastern Europe and the former Soviet Union. Overall, I enjoyed this book mainly for the accounts of Soros’s high-stakes investing successes, but also for his interesting philanthropic efforts. Ontario’s 2009 budget included a switch from a retail sales tax separate from the GST to a harmonized sales tax (HST). Superficially, this may seem like a trivial change because the retail sales tax was 8% and the provincial portion of the HST will also be 8%. However, there are two main differences that will affect Ontarians. The first difference is known to most people: the HST will apply to more good and services than the retail sales tax does. The main change is that services will now be taxed at the 13% HST rate rather than just the 5% GST rate. If this were the only change, then it would represent a substantial tax hike. But, there is another less well understood difference that changes the equation. Businesses can now use input tax credits (ITCs) for the HST. A business that collects HST from its customers doesn’t have to give all this money to the government. The business deducts the HST paid on the products and services it purchases to run its commercial operations. This system was used for the GST, and now it will apply to the provincial portion of the HST as well. - Total sales tax remains 13%. - HST will apply to more goods and services than the old retail sales tax did. - Businesses only have to pay their net HST. The overall effect is to lower the sales tax charged to businesses, on average. Of course, some businesses specializing in services (such as my consulting business) will pay more sales tax, but the average business will pay less. In theory, lowering the sales taxes on businesses should lead to lower prices and a net lowering of costs for consumers. In practice, we’ll have to see how things play out. 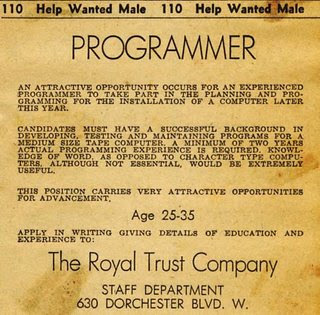 I was struck by the obvious sexism and ageism: must be a male between 25 and 35 years old. The point is not to call out this newspaper or the company placing the ad, but to realize that this was an accepted common practice at the time. Slow change can creep up unnoticed, but it’s obvious that the world has changed quite a bit (for the better) since this ad was placed. Direct Energy is well-known for its flat-rate natural gas plans. By guaranteeing rates for a period of time, they are in effect acting as an insurance company. Any time you buy insurance, you need to find out if the other party is financially sound enough to follow through on its promises. According to Direct Energy, they currently offer a two-year flat rate natural gas plan in my area at a rate that is about 30% higher than the variable rate that I’m paying right now. This added 30% amounts to a premium for 2 years of insurance against rate hikes. But what happens if natural gas supplies are interrupted and rates spike up? Will Direct Energy be able to fulfill its promises if variable rates double? I have no idea, but anyone considering entering into a flat rate plan should find out. If Direct Energy isn’t able to maintain promised rates, customers could end up paying the flat-rate premium and then paying the high variable rates too. Any time we enter into agreements with another party who is promising to deliver something in the future, we must consider the financial health of the other party. AIG employees entered into a bonus agreement with AIG, but it turns out that the company would certainly have gone bankrupt were it not for government intervention. If AIG wasn’t too important to be allowed to fail, the bonus agreements would have been worthless, not because they weren’t legal, but because AIG wouldn’t have been able to pay. When I left a former employer, I chose to take the commuted value of my pension rather than leave it in the company plan. I didn’t do this because I did the accounting and determined that the commuted value was worth more than the future promised payments. I did this because I doubted the company’s ability to fund the pension plan until I turn 65, and I doubted that the government would step in to protect the full amount of my pension. It may be that Direct Energy is financially sound enough to honour their fixed rate plans even if natural gas prices spike. But, why would anyone pay the premium for a fixed-rate contract without first investigating the financial backing of the rate promise? Market timers often jump out of the stock market when they think it is going down in the hopes of getting back in at lower prices. For this to work, the investor has to get out early enough and back in early enough to avoid selling low and buying high. 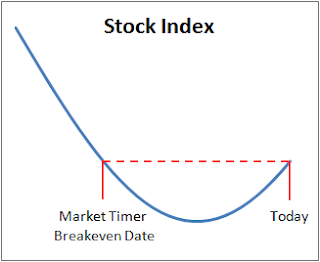 This brings us to the idea of a “market timer breakeven date.” The following picture illustrates what I mean. Let’s assume for the moment that stocks are now on the rise. A market timer getting back into the market today would have to have sold out of the market before the breakeven date shown in the picture to come out ahead. Any given day we can draw a line over to see the new breakeven date. As stocks rise, the breakeven date moves further into the past sweeping by the exit dates of investors who haven’t jumped back in yet making them losers in the market timing game. Of course, the stock market doesn’t move in a nice smooth curve like the one shown. It jumps up and down mostly unpredictably. Looking at the chart of the TSX, the most reasonable breakeven date corresponding to today’s closing TSX index level is Oct. 24, 2008. So, if you jumped out later than this date and haven’t jumped back in yet, odds are that if stocks continue to rise, you’ve lost the market timing game. I’m hoping that the economy continues to improve, stocks keep rising, and the breakeven date keeps moving further into the past. I’m starting a new Sunday feature looking back at selected articles from the early days of this blog before readership had ramped up. Enjoy. Many people own units of mutual funds in retirement savings without knowing much about them. Here’s a little story that is hopefully more useful than the usual dry definition. We are bombarded with messages in ads and from financial planners telling us to buy mutual funds. But, what are mutual funds? It’s a good idea to have a basic understanding of what mutual funds are before ploughing years worth of hard-earned income into them. To start with, let’s go back to a time years ago when there weren’t any mutual funds. An average guy we’ll call Jim heard some good things about the stock market, got curious, and spoke to a stock broker about buying 5 shares of Buggy-Whips-R-Us. The stock broker seemed friendly at first, but when he asked if Jim meant 500 shares, Jim started to feel uncomfortable. The broker went on to explain that his company charges commissions whenever people buy and sell stocks, and that these charges would be nearly as much as the cost of the 5 shares Jim wanted. So, Jim left feeling small and foolish. Undeterred, our hero had an idea. What if he got several of his friends together to pool their money? If ten people wanted to buy 5 shares each, they could spread out the commission charge on buying 50 shares. After the Buggy-Whips-R-Us stock went way up, they could sell all the shares and split the money. So far, all I have described is an investment club, but we just need to add a few more things to get to the modern mutual fund. Jim’s investment club was wildly successful and eventually grew to hundreds of members. They bought and sold many types of stocks and had fair rules in place to determine what fraction of the stocks each member owned. However, it became increasingly difficult for the members to agree on what stocks to buy and sell. Most members had little to contribute, but several members would argue fiercely. Jim realized that they needed an executive committee elected by the members to run the club and an investment committee chosen by the executives to choose the stocks to buy and sell. As the club continued to grow, it controlled a lot of money, and Jim decided that the club could afford to pay a clever guy named Ted to do the stock picking. The idea was that a professional would make more money than the existing investment committee on the investments, and this extra money would be more than Ted’s salary; the members would make more money. At first Ted seemed to work out well. It was hard to tell over a short time whether he was doing a good job, but Ted always explained his decisions to the membership and patiently answered questions. However, there were some rough periods, and Ted got nervous whenever the club discussed replacing him or going back to the old system of volunteer members doing the stock picking. Ted began to spend as much time protecting his job as he did on stock picking. He would take credit for the club’s stocks increasing in value even when it was just because the whole stock market had gone up and had nothing to do with Ted’s brilliance. Whenever the club’s stocks went down, Ted would talk about the current “difficult period in investing” and the “troubled waters” in these “turbulent and frightening times”. Because working for the investment club was Ted’s full time job, he was able to put a lot more effort into achieving his goals than the volunteers on the club’s executive committee who had other jobs. Over time, Ted was able to increase his pay significantly, hire assistants, and control who served on the executive committee. As the club continued getting bigger it became a mutual fund with the club members owning units in the fund. Ted’s role was filled by a company that specialized in money management, and although the mutual fund was officially being run by its board of directors chosen by the fund’s owners, in reality the club was being run by the money management company. Jim no longer had any meaningful say in how his club ran. Fortunately, the government enacted laws to protect mutual fund owners. The management company has to make certain key information about investment style and risks available to new purchasers of mutual fund units, and there are rules about how the fund’s investment returns can be presented. As we can see, the basic ideas behind mutual funds and the motivations of the various players involved are a lot simpler than it might seem from looking at the vast array of information available about mutual funds. The media are bombarding us with comparisons between the current recession and the great depression. Many reporters try hard to find economic measures that make our current situation seem worse than the depression. Stock market losses over the past 9 months are one area where we seem worse off than those who experienced the losses in 1929. While Canadian stocks as measured by the TSX dropped to 5 and a half year lows last week, US stocks as measured by the S&P 500 dropped to 12-year lows. So, US stocks prices are at levels not seen since 1997. And we all know what a stink-hole the world was back in 1997. Giant worms roamed the streets killing people. No, that was a bad movie I saw. Actually, 1997 was pretty good for me. I enjoyed my job, played sports, and had a loving young family. Life was good even without an iPod. Current circumstances are no fun for those who have lost their jobs, but it’s hard to compare the inconvenience of having to take a lower paying job and cut back on lifestyle expenses against the depression era devastation of people walking away from dust farms because nothing would grow. We seem to need to believe that our suffering is somehow greater or more important than the suffering of others, but in this case, it just isn’t true. We seem to be getting along reasonably well, and I’m optimistic about the future. Until recently, I hadn’t thought much about the collision part of my car insurance. When my car insurance renewal papers arrived, I puzzled over them for a while trying to see if there was any way to reduce the premium. To figure out whether it’s worthwhile to carry collision insurance, you have to know how much the insurance company will pay in the event of an accident. You’ll never get more than the write-off value of the car. Even though you might not want to get a new car, the insurance company won’t fix a car if the repairs cost more than they think the car is worth. My car is getting older, and based on what the insurance company representative told me on the phone, my best guess of its write-off value is about $5000. I also have a $2000 deductible, and so the most the insurance company would ever pay me for my car is $3000. The fact that it is worth more than this to me is irrelevant. For this $3000 of coverage I would have to pay $309. I doubt that the odds of writing off my car over the next year are over 10%, and since I can afford $3000 (in addition to the $2000 deductible) the collision insurance isn’t worth it to me. One part of all this that I can’t understand is that the collision insurance on my car is actually higher now than it was when the car was new, even though its write-off value was considerably higher back then. Any insights from readers would be appreciated. For people who like to optimize and are expecting an income tax refund, we are now into income tax filing season. For those who will have to pay more, tax filing season won’t come until the end of April for Canadians and April 15th for Americans. Ordinarily I prepare my taxes a little at a time until I finally receive the last slip I need and then e-file my return to get the refund as soon as possible. This year I decided to see how long it would take to complete the full task of filing my taxes. So, I didn’t do any advance work beyond storing slips and receipts in appropriate folders. One day when I was satisfied that I had all the required information, I started working on the taxes for myself and my wife at 1:00 pm. This began with buying a copy of QuickTax online and installing it. My reason for using QuickTax is mostly momentum. I know how to use it, and haven’t seriously tried other options. It’s amazing how some tasks always seem to take longer than they should. I didn’t complete our personal returns and e-file them until about 5:15 pm. Then I worked on my GST return for business income and drove to the bank to pay a small amount of GST owing. I got back at 7:00 pm which meant that the whole task took 6 hours. Our returns are quite simple, and I can’t really justify why it took 6 hours, but it did. If we make the sweeping assumption that 6 hours is typical for roughly 10 million individuals or couples filing taxes in Canada, the total time devoted to filing taxes is about 7000 years, or nearly 100 lifetimes. I suppose the real figure could be anywhere from 10 to 1000 lifetimes, but no matter how you calculate it, that is a lot of time lost each year to our income tax system. I offer the following story with apologies to Dean Staff who appears to be the author of the original version. Big Ted lived a full life and died in the year 2000, leaving only $10,000 to be split equally between his sons Ted Junior and Tim. Tim took his $5000 and immediately invested in the hot stock of the day, Nortel. After paying the sales commission, he got 40 shares. Ted Junior was more like his father and decided to spend his money on a huge party for his friends. Ted’s $5000 paid for 166 cases of beer that was all consumed in a huge bash. It took a week to clean up after this party. Ted piled all the empties in the back of his garage and forgot about them for a long time. A month ago, Ted decided to clean out his garage. A few of his friends who had partied with him over 8 years earlier helped bring all the empties back to the beer store. There was surprisingly little breakage, and Ted got back enough from the empties to buy 13 more cases of beer for another smaller party. This time Ted took the empties back to the beer store promptly for a return of 13x$2.40=$31.20. This was just enough to buy another case. He finished the last beer in that case last night and cashed in the empties this morning for $2.40. Over his coffee this morning, Tim was checking his stocks. At the bottom of the list was the sad line showing his shares of Nortel. After the 10 to 1 reverse split of Nortel stock, Tim’s 40 shares had turned into only 4 shares. They now trade for only 10 cents each. Tim’s original $5000 investment is now worth $0.40. People are likely to see different morals in a story like this. Some will say “live for today.” Others might say that stocks are too dangerous. I think the real moral is to avoid buying the hot stock of the day and make sure that your investments are properly diversified. Do-it-yourself (DIY) investing means different things to different people. When experts list potential pitfalls of the DIY approach, the message can be misleading depending on what DIY investing means to the reader. An investor who investigates companies and chooses individual stocks to buy is clearly a DIYer. Larry MacDonald’s article on the pitfalls of DIY investing offers good advice for someone who is considering this route to investing. At the other extreme we have someone who hands control of his portfolio to an investment advisor who gets paid a substantial portion of the portfolio each year. This type of investor is clearly not a DIYer. A gray area is the index investor. In one sense, index investors are DIYers because they aren’t paying for investment advice. On the other hand, they don’t choose their own individual stocks and bonds, which makes them seem less like DIYers. For the index investor who doesn’t engage in market timing, the standard list of DIY investing pitfalls doesn’t apply. Beyond an initial decision of which indexes to buy and in what proportions, index investing takes very little time, there is no need for immersion in financial minutia, and there is no reason to stay on top of the latest business news. The main pitfall of index investing is getting off track. Investors can be scared off track by large drops in stock prices or frightening financial media reports predicting doom. They can also get off track by becoming overly confident in their abilities and choosing to take some chances based on hunches. Between job losses and investment losses, many of us have a need to reduce spending. However, when it comes to maintaining lifestyles, momentum is difficult to overcome. Adjusting the way you think about wealth might help. Sometimes a big price increase can jolt us out of an expensive habit. People who lose their jobs often keep paying for ultra cable TV service, but what if its price suddenly rose 50% or more? Even people with healthy finances might drop down to a lesser cable package in the face of a big price increase. This brings me to the mind game. What if we stopped measuring wealth in dollars and instead measured it in units of our favourite index ETF, like XIU for example. XIU holds stock in the biggest businesses in Canada. Each unit represents a slice of various big companies, which includes real estate and many other valuable assets. In contrast, money is just pieces of paper, bits of metal, and electronic data that have very little inherent value. A unit of XIU has real value that the roughly twelve loonies it currently costs to buy the unit do not have. So, instead of having $300 in my chequing account, I might think of it as having cash whose value is 25 units of XIU. In this view of the world, the 1000 units of XIU in my retirement account haven’t changed in value. What has happened is that cash has become expensive. By this measure, most other things have become expensive too. Nine months ago, I could buy two cases of beer for about 3 XIU units, but this is up to 6 units today. Taking this view the price of consumer items has shot up over the last several months. This makes the need to cut back on spending more obvious. All of this may be just a mind game, but if people need to spend less and can’t do it, maybe a mind game is just what they need. I saw a piece on CBC Newsworld saying that compact fluorescent lamps (CFLs) don’t save as much money as many people claim. The piece made the explanation seem mysterious and complicated, but it’s quite simple. The problem with the standard analysis is that it ignores secondary effects. The relevant secondary effect here is heating. All energy absorbed by a light bulb ultimately turns into heat. Even the light produced will bounce around off objects and eventually turn into heat. So a light bulb inside your house is like a mini electric heater. A tiny fraction of the light might escape through a window, but for practical purposes, 100% of the energy heats your home. Here’s an example of the standard analysis of savings. Suppose that you replace a 60-Watt incandescent light bulb that gets used 6 hours per day with a 15-Watt CFL. Power consumption drops by 45 Watts for 6 hours per day. This saves a total of 8.2 kilowatt-hours per month. Assuming a cost of 12 cents per kilowatt-hour, you save a hair under a dollar each month, or $12 per year. A real analysis that factors in heating gives a different result. The simplest case to analyze is a house heated with electricity. During the heating months the electric heaters will have to make up the lost 45 Watts of heat that used to come from the incandescent light bulb. This exactly offsets the CFL’s supposed savings. The net savings during heating months is exactly zero. During months requiring no heating or air conditioning, you will save the dollar each month. However, you may heat your home a little longer into spring if you’re not getting as much heat from light bulbs. This effect should be fairly small. During months where you use air conditioning, you actually have to spend extra money on air conditioning to get rid of the heat created by light bulbs. So, the savings from using a CFL are more than a dollar per month. Overall, the yearly savings will depend on how many months you heat and use air conditioning, but in a Canadian climate the total savings per year will be less than the $12 from the simple, but flawed analysis. Another complication in this analysis comes if you use non-electric heating such as natural gas. As it happens, the total cost per unit of energy from electricity and natural gas for me are both about 12 cents per kilowatt-hour once you take into account all the extra charges and taxes. But, if the natural gas were more expensive than electricity, then the CFL would actually lose money during heating months. One situation where CFLs are a very clear winner is in outdoor lighting. In this case the heat generation is irrelevant, and the cost savings of CFLs are significant. If you haven’t tried CFLs yet, you may want to start with your outdoor lights. 1. Jason Zweig at the Wall Street Journal has some ideas to allow you to get a feeling of control over your investments. Investors often make big mistakes when their react emotionally. Zweig’s suggestions may help investors deal with their emotional side. 2. On a theme similar to Zweig’s article, Larry MacDonald has some ideas on how to tough it out during hard times for stocks. 3. Preet explains how financial advisor behaviour is driven by a compensation grid. 4. Potato tells us that Petro Canada Mobility is jacking up its rates for cell phone air time. In addition to increasing the cost of air time, they are increasing the minimum deposit from $20 every 6 months to $25 every 4 months, an 87.5% increase. I have a cheap Petro Canada cell phone mainly because I use it so little that the minimum deposit is relevant to me. Thanks for the warning, Potato. I’ll be getting rid of this phone if I can find a better deal. 5. The Big Cajun Man dug into his archives for the story of how he made allowances for his kids work for his family. 6. Ellen Roseman’s article about the problems people are having with Co-operators Insurance, Aeroplan, and Bell Internet generated quite a few comments. 7. Frugal Trader has a tip for cutting down on impulse spending. Big changes are taking place in the world economy due to the shock of the credit crisis. These changes have come on too quickly and severely, but the changes themselves aren’t all bad. For this discussion it’s convenient to think of all people as being either spenders or savers (as I did once before). Spenders borrow from savers for consumption, and savers lend to spenders with the promise of getting paid back with interest. It turns out that the promised levels of interest on borrowed money were illusory. Spenders are defaulting on loans, and savers are eating the losses. Even when bad debts are covered by the government, this amounts to a flow of money from savers to cover the bad debts. During the long period leading up to the credit crisis, spenders were being permitted to consume more than their fair share of resources. The world economy adapted to this situation by producing goods and services consumed by spenders. The world produced too much clothing for shopping addicts and too many flashy cars. Now that spenders have had their lines of credit cut off, there has been a huge shift in spending patterns. The economy will have to adapt to demand that includes more of the consumption habits of savers and less of spenders. Right now the pendulum has swung too far towards very low consumption. But when things settle out, our world will have less reckless consumption, at least until the next financial bubble arrives. I’m looking forward to a world with more practical goods and services. Goods aimed at spenders aren’t going to go away; they are just going to make up a smaller fraction of our economic output. That’s a good thing. Bernard Madoff’s lawyers are arguing that a Manhattan apartment and $62 million are unrelated to the fraud investigation because they are in his wife’s name. Nothing ventured, nothing gained I suppose, but this one doesn’t pass the sniff test. It’s hard to wrap my mind around the extent of the crime here. Madoff is accused of a $50 billion fraud. That would be like committing a $1 million fraud once a day for over 130 years! The idea that he could come out of this with anything more than some worn personal items in a suitcase sickens me. It will be interesting to see whether the legal system is able to give Madoff any kind of meaningful punishment. One thing that seems certain is that the process will take a long time.